Do Puppy Training Pads Really Work For Housebreaking? You are here: Home / Tips and Guides / Do Puppy Training Pads Really Work For Housebreaking? If you are keeping your puppy in the house, then one of the first things that you will want to do is work on house training your little pup. When it comes to housebreaking a new puppy, there are a few different thoughts on the absolute best way to do it, but using puppy training pads is probably the most common. In fact, many people swear that they offer the easy way to potty train a puppy in the home. Sounds too good to be true, right? Keep reading to find out if it is! When I was younger, these puppy house training pads were not really a big thing and my dad just used old newspaper in the corner. Now that I am older, I have test out these puppy pee pads for myself to see if they really work or if they are a waste of money. Using Puppy Pads – Yea or Nay? While they don’t present the most attractive look in your home, puppy pee pads are a staple in a lot of pet owner’s homes. The reason for that is because they can work when it comes to potty training that new puppy. Of course, like anything, this is not true for everyone. The reason is because you have to actually train the puppy to use the pads. That’s correct – puppy pads do work but only with the proper training of the dog. Without training, you’ll end up with the puppy going to the bathroom behind the couch or other areas of the house and using the potty pad to sleep on or just avoiding it all together. Here’s the thing – the pee pads are designed to have a scent that is supposed to draw the puppy to them when it has to go to the bathroom. While that may be true, it won’t matter if the dog isn’t trained, or learns, to poop and pee on the pads. This is where your work really matters. If you are going to attempt to use pee pads with your new puppy, then you cannot just place them in a corner of your house or the puppy pen and expect the little furry cutie to go to the bathroom there. Instead, you have to teach him or her that the pad is to be used for bathroom breaks. Treat time on the pee pad just like when you take the pup outside for potty breaks. 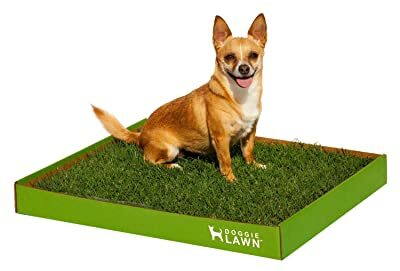 Stand over the dog and keep him on the pad until he pees or poops. If nothing happens, put him back in his pen or crate (or other area) and then try the same thing again later. This creates a behavior pattern that helps the puppy learn the proper place to go to the bathroom inside the house. The use of puppy pads, or pee pads, should ideally start on the day that you first get the new pet in the home. You can find these at local pet stores, or if you have time to wait for delivery, you can get a great price on them online on Amazon. 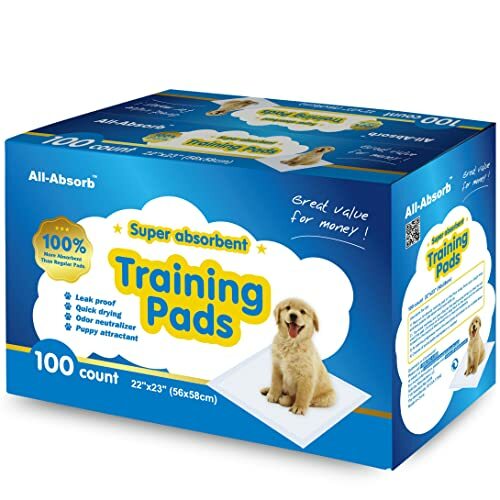 In fact, I think the best puppy training pads value for the money are the All-absorb Training Pads. These are great for puppies as well as smaller dogs, plus you get 100 of them at a super low price. I suggest that you give them a try if you can as they work well and have a cheap, low price. Puppy pads are a joke, all you are doing is teaching these dogs how it is alright to pee and defecate in your home, take the puppy pads away and the first place they head is to your carpets or any clothing you may have on the floor. Puppy pads should only be used by those that can’t take their dogs for a walk or if the dogs are sick. I will never buy a dog from a breeder that has trained their dogs on puppy pads. My pug took years to retrain after being allowed to pee in the breeders home.